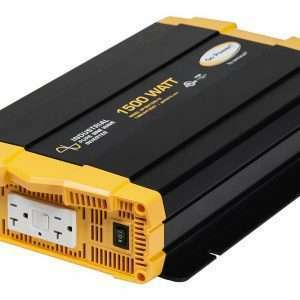 Go Power inverters come in both modified sine wave and pure sine wave technologies, and are known all around the world for their quality and reliability. They have DC to AC power inverters ranging in size from 150 watts to 3000 watts which are small, light, and very simple to install. Many of Go Power’s inverters are UL approved and make a great choice for your RV, motorhome, work or fleet truck. Go Power also has different sizes of premade install kits that makes installation a breeze. Any inverter by Go Power comes with at least a two year manufacturer’s warranty, so you can be rest assured that your inverter will be their for you today and tomorrow. Go Power also has a full slate of complete solar and portable solar systems. Everything from panels and charge controllers to install kits and mounting hardware. If you have a questions about Go Power products, call the experts, call us today!